Cariboo Memorial Hospital ED goes lean! The Emergency Department (ED) is a highly specialized area within any hospital. On any given day, it’s impossible to predict who (or what) will come through the ED doors and staff is expected to treat a broad spectrum of acutely ill patients, some of which may be experiencing life-threatening injuries that require urgent care. With specialized equipment in abundance and patient overcrowding a constant problem in the ED, equipment and supplies must be readily available at any moment. If ED staff can’t find what they need immediately, the end result can be harmful or even deadly for patients. 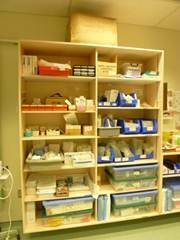 To improve efficiency and safety in the ED, Cariboo Memorial Hospital in Williams Lake recently made improvements to the way equipment and supplies are organized. By applying the principles of lean (an ongoing process of making improvements as directed by frontline staff to improve flow and reduce waste) Darla Yuill, Patient Care Coordinator, says the changes have made significant improvements in the delivery and overall quality of care in the ED. Trauma Room before lean. 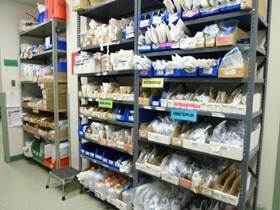 Equipment and supplies are disorganized, unlabelled or missing, making patient care challenging for ED staff. The concept sounds simple – make supplies and equipment easier to find, reduce waste and increase efficiency and flow – but re-organization can be a challenge when urgent patient care takes precedence in a busy ED. Trauma Room after lean. 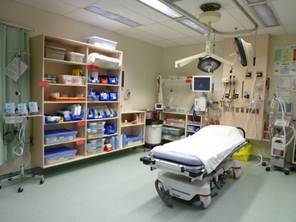 Equipment and supplies are readily available and space around the bedside is clear of unnecessary equipment. Congratulations to all the staff at Cariboo Memorial Hospital! Storage room after lean. Equipment and supplies are clearly labelled and organized for easy, quick access. The truth is, organizing is one of my favourite activities! It’s great to see patients benefit from improvements like this. Nice work!